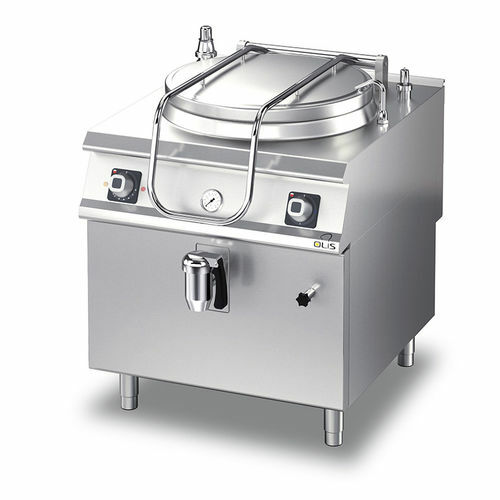 Electric boiling pan / floor-mounted / commercial - D94/10PEI15 - Olis Ali Group S.r.l. Public buildings > Commercial kitchen > Electric boiling pan > Olis Ali Group S.r.l. Stand: Olis Ali Group S.r.l. Group: Olis Ali Group S.r.l. D94/10PEI15 Olis Ali Group S.r.l. Outer casing and feet in stainless steel. Adjustable worktop height, ranging from 840 to 900 mm. Adjustable worktop height, ranging from 840 to 900 mm. AISI 304 stainless steel pan with base in AISI 316 stainless steel. Water loading using the tap and both hot or cold water may be loaded. Front discharge with 2-inch chrome brass taps. Indirect electric model: 2 armoured heater units mounted inside the cavity for heating operations. IPX5 protection against water splashes.